Issue 12 of Haunted is here for your roller coaster ride into the unknown, packed full of spooky features from our take on those Black Eyed Kids to a ghostly delve into hotels that will literally scare the bejesus out of you, from an update on The Slenderman to a look at the history behind one of the most iconic horror stories EVER!! 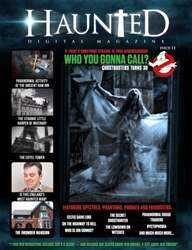 Over 110 pages of what we like to call “paranormal pleasure" AND best of all, we’re making it even easier for you to read as we’re making Haunted FREE, nada, nil, zero, zilch – no strings, no gimmicks, no catches – before we turn into the unruly teenager (Issue 13) we’re making the best paranormal magazine out there even more accessible to lovers of the paranormal and things that go bump in the night – GET YOUR COPY NOW!! ARE YOU READY FOR THE HAUNT? BECAUSE WE’RE BLOODY READY FOR YOU!! !